It's no big secret that Lisa and I do not exchange Christmas gifts with each other. Instead, we surprise each other with "just because" gifts throughout the year. This is something we talked about back in 2011. That Christmas, we didn't buy a single gift for each other. Throughout the following year, we surprised each other with gifts. It's been a tradition ever since. A couple of days ago, I received a few gifts from Lisa. 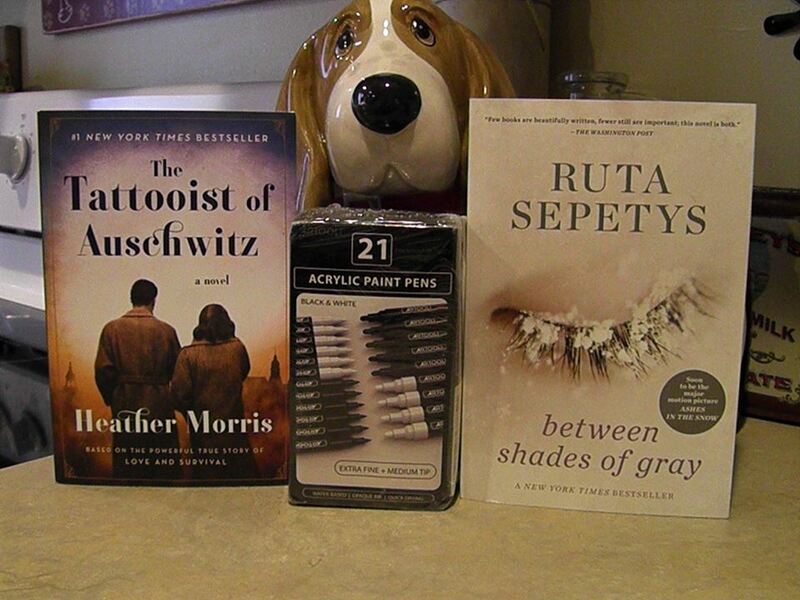 Two books ('The Tattooist of Auschwitz' by Heather Morris and 'Between Shades of Gray' by Ruta Sepetys) and a really nice set of Artooli Acrylic Paint Pens. Although every gift Lisa surprises me with is incredible and means the world to me, these three gifts stood out because they were the result of two conversations I had with Lisa not too long ago. The first conversation took place over dinner one evening back in late March. I went through a spell where I was having a hard time falling asleep at night. Usually, after I tuck Lisa and the kids into bed around 8:30, I stay up a bit later to work on blog columns. By that time, I'm exhausted. I've been known to fall asleep while typing blog columns. However, as of late, that hasn't been the case. For a while, I gravitated to my old, trusty standby of playing Cookie Jam and Cookie Jam Blast, but that wasn't working either. I told Lisa that I was going to revert back to what I used to do before bed. I was reminded of how well this worked when a dear friend of mine lent me a book to read earlier last month. I read the entire book in three nights. Unplugging and reading books relaxes me. I love reading books. I always have. During this particular conversation, I told Lisa about a couple of books that I wanted to get my hands on. The second conversation took place last Saturday after we got a rather large custom order for 21 signs. These signs had a lot of writing on them. I jokingly said that having acrylic paint pens would make my life so much easier and my freehand lettering is much better with a pen than a paintbrush. Up until now, I've always used a fine paintbrush to do lettering. It's more economical. Good quality paint pens are not cheap. In addition, it's hard to find a set that only has the colors and tips you want. Usually, you have to purchase them individually or in sets that has additional colors. In my case, I only want black and white acrylic paint and medium and fine tips. I located a set that included 21 acrylic paint pens. Black and white. Medium and fine tip. A bit pricey, but they're excellent quality and would last a long time. Those two conversations transpired into Lisa presenting me with the two books and a set of Artooli Acrylic Paint Pens. I am beyond grateful and excited to dive into the books and use the acrylic paint pens. More so, I'm thankful that we began this tradition many years ago. 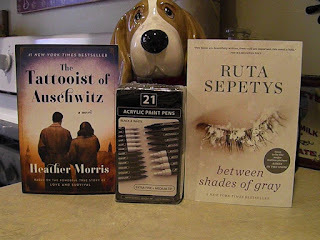 These books and the acrylic paint pen set mean more to me than some gift chosen on a whim just because it's Christmas.